Put simply, cancer cells have aberrant energy metabolism compared to normal cells. Metabolic Cancer therapies attempt to exploit this difference. Cancer cells have a reduced capacity to generate energy with oxygen (oxidative energy production), with a concurrent increase in energy generation without oxygen. A healthy cell produces 89% of its energy using oxygen, and 11% through non-oxidative metabolism (non-oxidative metabolism is also known as “fermentation”). Oxidative energy production is far more efficient than fermentation. Almost 20 times more energy is released when glucose is completely oxidized, as opposed to when it is fermented. Healthy Mitochondria. Note the abundant looping structures inside the mitochondria (cristae), this is where all energy is produced through oxidative pathways. Image of a mitochondria from a cancer cell. Note the almost compete absence of cristae. Oxidative energy production takes place in a cellular organelle called the mitochondria. The mitochondria are known as the cellular “power plants.” Also telling is the fact that the greater the degree of fermentation displayed by a given cancer, the more aggressive the cancer. Because a tumor cell’s mitochondria appear to be damaged, and are therefore forced to generate energy by such an inefficient pathway, they have to consume much more glucose to remain viable. 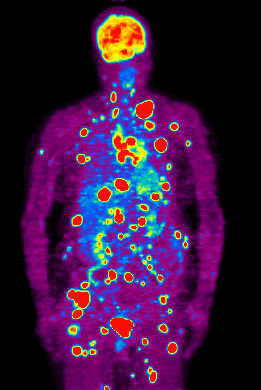 A glance at a PET scan, which uses a radioactive labeled glucose analog to image cancer, provides stunning visual evidence of the voracious appetite tumor cells have for glucose compared to normal tissue. It is well established that once a cell has an impaired ability to produce energy through oxidative pathways, the genomic instability (increased potential for DNA mutations to occur) that accompanies tumor development, inevitable follows. While it’s true that most of the agents known to cause cancer; chemical carcinogens, viruses, radiation, and inflammation can cause mutations to DNA, it is also true these provocative agents damage the mitochondria. The metabolic theory of cancer states that once the mitochondria of a given cell acquire a threshold degree of damage, and the cell reverts to fermentation to obtain energy, a plethora of metabolic and epigenetic modifications participate in the origin of cancer. 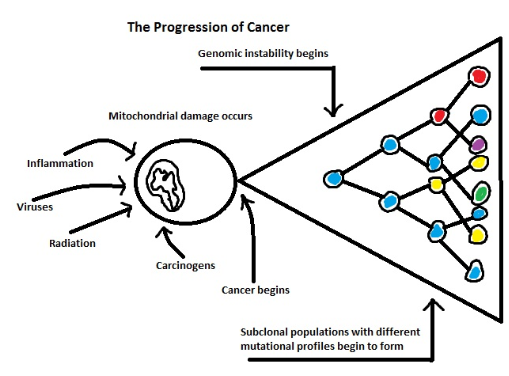 Diagram showing the progression of cancer. Once a threshold degree of mitochondrial damage occurs uncontrolled proliferation begins. The different colors depict cells with different mutational profiles within the same tumor. If a drug is developed targeting a specific mutation, the presence of sub clonal populations with different mutations will most likely render it ineffectual. A series of elegant nuclear transfer experiments preformed in the mid 1980’s provide powerful evidence that metabolic and epigenetic factors are important drivers of cancer. 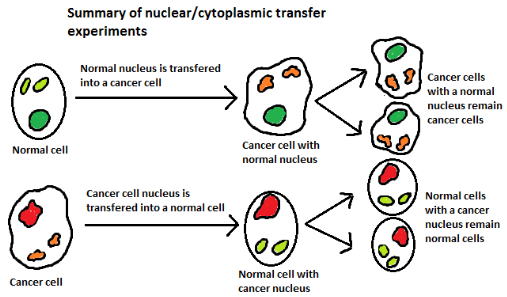 When the nucleus of cancer cells were transferred into normal cells the cells remained normal. However, when the nucleus of normal cells were transferred into cancer cells, shockingly, the cells maintained the malignant phenotype. These simple experiments illustrate the importance of factors other than mutations to DNA as drivers of cancer. It is these drivers that metabolic cancer therapies attempt to exploit. Without question the metabolic therapeutic approaches explored so far have exhibited tremendous promise with minimal side-effects. The first and most obvious place to start is by implementing a ketogenic diet, starving the cancer cells of the glucose they so heavily rely on for survival. The preclinical results have been remarkably consistent. In virtually every experiment in which the ketogenic diet has been tested in mice, tumor growth rates have slowed. The results of the diet stand alone, but the results get really exciting when the diet is utilized in addition to other therapies. Preclinical evidence has shown that the ketogenic diet is able to put cancer cells under significant metabolic stress allowing addition therapies, like standard-of-care chemotherapy, radiation, and hyperbaric-oxygen to push the cells over the edge, increasing their efficacy exponentially. And this is just scratching the surface. So much remains to be done. We don’t want to sit on our hands waiting any longer.